Likewise, the Reverend Calvin Butts, III, of the Abyssinian Baptist Church of New York, opined recently at a United Nations conference on Islamophobia: "Whether Muslims like it or not, Muslims are labeled people of color in the racist U.S ... they won't label you by calling you a n----- but they'll call you a terrorist." For the Rev. Butts, counterterrorism amounts to racism. June 12, 2014 update: Jim Goad, "Am I A Racist? 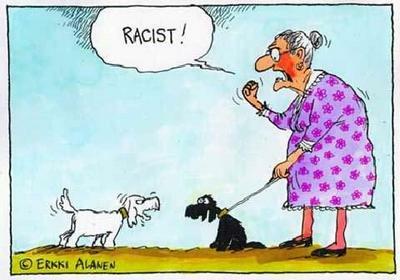 Depends On What You Mean By 'Racist'," does a nice job of distinguishing between the varied meanings of this word.